Lightorbs or Orbs really like it to show themselves on photos. However it is rather difficult to define the distance between the Orb and the camera, unless they show themselves behind subjects like branches etc. In that case we at least have an indication about the distance for we know the distance between the camera and the subject. 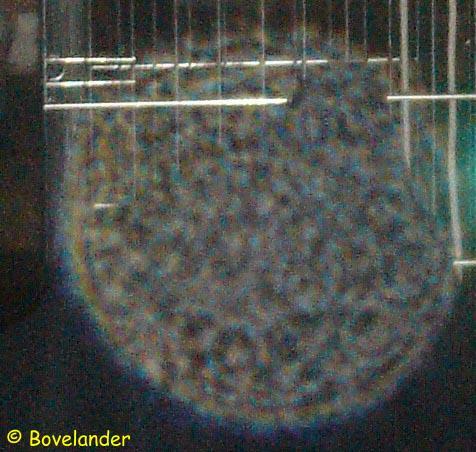 But still another question is remaining: are Orbs flat or do they have a ball form shape? Take care! I'm talking about 3D so about length; breadth and height. So not about the capability of Orbs travelling between the to be seen and unvisible dimensions. Some bars of the bench are visiual, some are not. The upper top of the Orb clearly is situated inside the bench. The black area in front concearns a chair on wich a coat was hung. However this chair was standing about 1,5 metres!!! before the bench and is the orb quite clearly to be seen in front of that chair with that coat. The Orb has all characteristics of a "classical" Orb. (The charastical ring around it and the structure inside of it) For that reason it has an unexpected depth in it! For a good reference it might be usefull to compare my findings with the full sized photo. The vertical rods are part of the construction of the bars that hold the pavilion roof. The diagonal bars are connecting these vertical rods. The slanting stripes in front of the rods are ropes to give stability to the turn (gymnastic) aparatus the performers were using. They are clearly in front of the orb. A: This rope is in front of the Orb. Can be seen in the entire photo. B: Rod B is partly before, partly behind the Orb. like we can see in the other ropes used. It is there on rather certain distances. D: The orb is behind the artist's shoulder. It cannot be else as the Orb is partly in front; partly behind and partly in that roof holding construction. Of course my great thanks are for Pieter Bovelander and Reiner Borchert, for posting me these photos, and their allowance to post them on this website.